I’m renting a place here in Fremantle for 3-4 months, and my first rental payment is due. I dutifully (ok a few days late as we had not sorted out dates) send a Telegraphic Transfer request via BNZ’s internet banking email system. This is something I do quite a lot, with the last one being the deposit and bond for this place on the 12th of last month. I’m in Perth right now, and so to get a NetGuard card would require 3-5 business days (and there are only 4 this week in NZ) PLUS the time taken to get the card to me in Australia. Moreover, I’m guessing that BNZ won’t send or allow you to send this stupid card internationally (try couriering credit cards). So… why should I trust my money to a bank that can’t even own its own domains? Why should I trust my money to a bank that requires me to carry around a card for online security? What happens if I lose my wallet with credit card and stupid online card? – yup, I’d be locked out. Sadly it was beneath the fold (line 26) of the confirmation email, which I browsed quickly just to make sure the payment went through. So the first time I saw this was today. Yes – perhaps I should read my emails completely. They say that banks have 4 opportunities in life to get you to switch to them: At birth/christening, when you are about 10 or so (pocket money), when you leave home/start university (student loans), and when you get a mortgage. They also say (ok I’ve observed through consulting) that losing banking customers is actually really difficult to do. You really have to go out of your way to annoy them, or lose serious credibility, before customers will leave. For me BNZ has provided great personal service at the various branches in Wellington, but has failed, and failed consistently with its IT – online and back end. – My credit card limit is a trivial % of my annual income, despite repeated requests for (mostly granted) increases. – Indeed it’s not the first time or even second I’ve failed to buy a motorcycle with a BNZ credit card, and succeeded with Amex. – I received more than one offer to ‘upgrade’ my Mastercard to a visa with identical features and higher cost. – BNZ’s after hours (and it is always after hours from home here) help desk is completely unable to help me, which is sad because I recall being able to speak to a very helpful night banker, who made magic happen, from the UK when buying a motorcycle back in 1996. What has happened? – The products offered to me (usually in a TT email) are completely irrelevant to my situation. – I cannot send an international transfer without recourse to email. – I now cannot send international transfers at all. NONE of this is acceptable in this era. But the big question is can any other bank offer better? I’m going to look around, but do let me know if your experiences elsewhere are better. Frequent “hopping/transfers” of their Personal Bankers!! Over the past year i’ve had 4 different personal bankers handling my account at one branch!! Completely agree. To increase direct credit limits I need to print off and fax, yes fax, a request through which takes up 24 hours to be processed. Can’t do international TT’s online so I have to walk into a branch, spend 30 minutes with a different staff member every time who doesn’t seem to be trained in the system. I have to walk them through each step. Switched to online forex dealers after realising BNZ were making $10k a year off me in their bloated currency margins. Their online statements only go back 6 months, ASB’s go back 12 months. Is it really that difficult to increase? Only with them because of their local monopoly over multi currency payment processing. When is another bank going to offer this?? Don’t even get me going on the merchant fees. I switched from BNZ to ASB when I returned to NZ. I got sick of their seemingly random fees that were attached to every little thing. ASB has been great so far – good online banking, great service, reasonable fees (at least understandable ones!). I was a long-time ASB customer and a very happy one at that. When I moved to Australia, I went with Commonwealth Bank hoping that since they owned the ASB that they would have similar customer service. I was shocked by how poor their service is (similar to what you’re saying re: the BNZ). I’ve now since switched to ANZ (which I would never have considered in NZ). I have accounts with ANZ, ASB and National. I have to say that ASB are the winners here in terms of Technology but National win in Terms of CS. You would probably be better with ASB travelling between NZ and AU however because they have St George in AU which i’m pretty sure you can do in-branch banking with. ASB have their netcode security system, which involves sending a text message with a code to your NZ mobile to valdiate certain transactions, which could work for you if you still have your NZ mobile number. This is however still fully optional. ASB also have instant ASB – ASB account payment and instant A/C – CC payments. No NZ bank has Bank – Other bank instant payment however as this relies on the InterBank system which clears payments between banks and the RBNZ at the end of each banking day. Sorry to drag this old post up, but I just had to comment. I have accounts with ASB, BNZ, RaboPlus and Westpac and have to agree with the BNZ sentiments. I’m in fact also only with them for the merchant account and credit card processing, and haven’t really taken the time to look around as to whether there are alternatives. From what Chris said in your comments though, it looks like I might be stuck with them too. BNZ’s online presence has been appalling since day one. For such a long time – long after ASB for example was offering regular online banking as we know it now – they still required software be installed on the user’s computer to allow access to their Internet Banking. This meant that your chances of banking while on holiday or on the fly were virtually nil. Now, Netguard is also killing it for me. With Westpac (whose DebitPlus card I absolutely love – NO MORE CREDIT CARDS FOR ME!!! ), I can simply text “b” to 202 and have my balance sent back to me almost instantly. With the BNZ however, I have to whip out my Netguard card and go through all that rigmarole – or make a toll call from my mobile. What a pain. I find banking in general to be very frustrating. The ridiculous opening hours make it nigh on impossible to get to a bank when you actually need to – although I do avoid the places as much as possible. Thank goodness some banks are starting to cotton on to Saturday opening. The delays on everything are also crazy – why in this day and age should I have to wait 24 hours for an electronic transaction to “be processed”!?!? Come on, get with the times. The banking sector needs a shake-up IMHO. This just confirms what a huge mistake we made in switching to this bank. We are very unhappy with BNZ. I truly wish I had conducted more research as I now find out they have the highest percentage of unhappy customers. We will be closing our account with “Bank of New Zealand” this bank should come with a warning. I must say, I am completely surprised by the people on this site who are this unsatisfied by the BNZ. I have banked there for about 5 years after switching from ANZ, and I find them wonderful. ANZ have their systems in the dark ages and when I stand in their queue (when closing my accounts this year) I had to watch Dr Phil on the TV above the tellers talking to a man who beats his wife and the blaring ads!! Finally get there and the teller had no idea what to do. Bank of New Zealand are always very proactive in letting me know when new products come out which always save me on fees or benefit me in some other way. They may have been expensive previously, but I now think that they are market leaders in improving the way we bank. And on that topic, I find the staff and the help and knowledge they provide worth paying a small monthly fee. Better than Kiwibank where you get a postal assitant!! Give the BNZ a break – I find that more than anything else its actually the person you get behind the counter who makes the opinion you form of the bank, not the finicky details. I think they are great, good on BNZ. I have been a BNZ customer since I bought my first investment properties three years ago. BNZ gave me a great banking package, and excellent rates. I have had awful experiences in-brqanch with other banks, especially ASB and Kiwibank, and while not all of the BNZ branches are great, I know where to go to get knowlegeable staff and good assistance.. I find BNZ’s internet banking service very good, the inter account transfers are instant, including to mny credit card, and I can transfer cash out of my cc instantly too. Not many other banks offer this service so simply. One of the best things about BNZ for me, is that their internet-banking cut-off time is 10:00PM. All the other banks I know of have an 8:00PM cut-off. I have been caught transferring money from my wife’s national bank ac after 8:00PM. You don’t get it until 30 hours later! You can’t even go into a branch and transfer the money manually, as the electronic transfer cannot be cancelled. I have never had problems like this with BNZ. On the whole, my experience is that banking satisfaction has more to do with personal bankers then anything else. Unfortunately, it seems that all banks share the problem that the useless bankers stay in personal banking, while the good ones get promoted, and pass their portfolios on to others who may not be so good. I would have to say that BNZ hasn’t changed much and there might be the odd good experience but overall fairly bad results. I came across this blog while in the proces of looking for the relevant marketing contacts at BNZ Bank. This is relevant due to the fact that just 30 minutes ago I announced to my “Personal Banker” at BNZ that oweing to the inflexibilities in their system I’ve decided to review my mortgage with them 1/2 way through its term. I am very vigilant with my accounts and as part of this i review all the charges on the account. The BNZ stands to gain $50,000 in interest off our mortgage over the next 7 years and when I asked for an additional rebate of $8, for charges recently incurred the reply was that I had already reached my limit for the month. In essence the BNZ cost up all transactions in the month, including any over the counter deposits, then apply this against a set rebate for the month to “show” how much you are saving. The rebate for a total relationship of less than $300,000NZD is $30NZD per month. I could detail the hypocrisy in their cahrging system that most people seem to just accept but the fact of the matter is that at the cost of $8 to the bank the “Personal Banker” has effectively thrown a $50,000 revenue stream into contention – which sane business does this? You could switch to Kiwibank. You can set up and send a TT direct from internet banking. No requests – full online process and extra security optional. Yes the BNZ has lost the plot . Add on fees that are not easily explained are loaded on to almost every transaction . The fees for handling cash are so high I turn it into a bank cheque and then bank it . Personal bank managers are high turnover and generally paranoid . After experiencing a total lack of common sense from my personal manager I arranged a meeting with his manager . It took 2 weeks and when he arrived he had no knowledge of my account and was unable to answer any of my questions . I have a 10 year history with the bank which is unblemished and was totally annoyed with the whole experience. I am looking forward to changing banks . 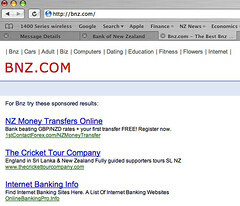 Google “bnz better off” or BNZ and look for the page title “BNZ Better off”. It looks like the bank is getting re-branded for stealing money for conservation! I had found this site after trying to do some research on BNZ. I only now just looked at the name on my new card, it reads “EEICKSON” is is meant to be Erickson, they need to sort themselves out alright. The card is fully working. I’ve sent a number of international payments through my BNZ account and have never had a problem. Transfers to the UK often arrive within a day which I think is pretty good. 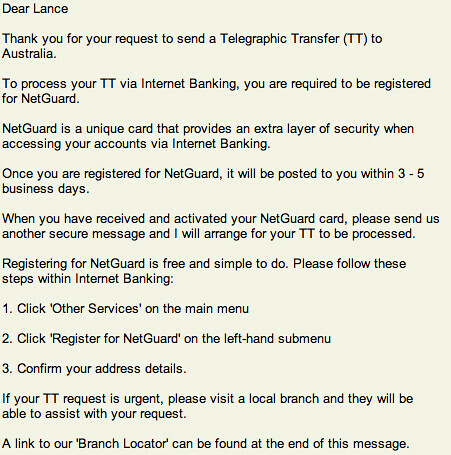 One reason I use BNZ is because they _do_ have NetGuard. I’d much rather carry an extra card around with me than risk having my bank account compromised by a hacker or password sniffer. I see your article is from a couple of years ago and I agree that fees were often excessive back then, but BNZ have a new initiative whereby they don’t generally charge penalty fees for unauthorised overdrafts, late payments, etc. With bankdirect(ASB) I got smacked $10 for being $5 overdraft on an account last month – that’s pretty tough. I do agree that internet banking could be improved. I’ve had online accounts overseas that were much more comprehensive. When visiting my mother in NZ March 2010, I sent a transfer over from Australian Bank Account to my mothers account. Cost of draft at Australian end was $25. That’s reasonable. Cost at New Zealand end, with BNZ, $25 to handle draft. That is to say, BNZ charge you for putting an already cleared bank draft into a BNZ account. TOTALLY UNREASONABLE. Doesn’t matter if $100 OR $1,000,000, $25 is taken off money sent. Received no upfront warning that this would happen. Any NZ bank does this. Grow up please. I was an equal 40% Shareholder in our family business with my brother, us both being Directors. BNZ saw to provide my brother with what BNZ termed as a link of the business bank accounts to my brothers personal internet banking program that I had no jurisdiction over and from this point my brother saw to act fraudulently within the company bank accounts with BNZ stating they were unable to assist me when I requested this internet connection to the business bank accounts be ceased. It was a year later that BNZ disclosed my brother having dual signing authority with my sister to business bank accounts this had been loaded and accepted by BNZ only for BNZ to act negligently in actioning the dual signing. Dual signing provided to BNZ 9/2/05 but failed to action until 10/3/06 when BNZ discovered the dual signing – BNZ actioned the dual signing for a period of four months whereby my brother signed with my sister and had the link of the company bank accounts to his personal internet banking program ceased. BNZ now fail to take responsibility for their negligence and failure in actioning the Dual signing from 9/2/05 rather BNZ have seen that this profitable family business ceases now to exist. BNZ saw to the demise of the company and my total loss financially. BNZ fail to date to admit their negligence and I would be obliged to seek legal action in the courts for which I would require large amounts of cash.. this BNZ have seen that I do not have and therefore BNZ will be seen to escape the wrong doing they have committed and I lose. Perhaps LOTTO will come through. BNZ are I believe a dishonest banking institute and it was my misfortune that I was associated with BNZ at this time. BNZ altered the bank account signatories as they saw fit in that BNZ withdrew the dual signing authority on the pretext if doubt and confusion existing and reinstated my brother with sole signing authority and again a link of the business bank accounts to my brothers personal internet banking program (all against my better judgement) and to the loss of the company entirely. Those doing international transfers now the BNZ is saying the receiving bank is charging a fee for international transfers or and intermediary bank is used when they do not have the access to process that countries currency. Give it a break it is australian dollars. Somewhere $A24 dissappears from the amount posted on their site till it appears in my ANZ account. The ANZ does not take fees for international deposits. “well I dont intent to pay any of them”her reply “well you have to”. I told her I dont see why I have to pay a $5 charge when we have money in your bank,its not right!! She said I wouldn’t be charged the $5 but it would take 48 hours for the transaction to go through. “thats alright with me” I said ,and I told her I wasn’t angry at her, it was the bank policy that I was angry with. Time we all stood up to our greedy banks ,the cheek of them charging us! for the use of our money!!!!!! BNZ will not miss you. I know it’s an old post, but “this is just the way banks are” in NZ, but we won’t generally change banks (like you say), partly because the competion is so easy for new banks like Kiwibank (they don’t need to be that competitive). I’m currently struggling to get some USD transferred between two Westpac USD accounts, or Westpac and ASB (both NZ accounts but in USD). 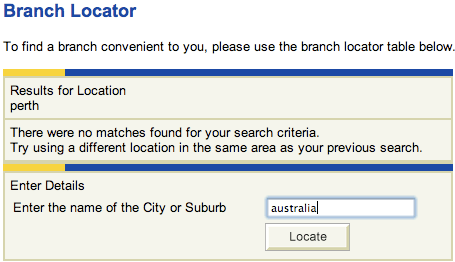 It was no great surprise to find this requires a T/T, but it is a pain, especially considering the bank couldn’t process it because the address details of the foriegn bank branch were’t provided by the forex service I used (just the local bank). This was all so I could transfer ~$5k from my Westpac USD to NZD account without paying the bank’s exhorbitant currency exchange fees, I’ve used the same forex service plenty of times to go the other way (since it’s effectively doing a T/T online – saves a lot of time and the T/T fee). Stuart Wright – I’ve been in similar situations before. The banks are usually quite strict, but where fraud is involved they can be too ready to accept the statements of a fraudulent person at face value (because it sounds perfectly plausible, the fraudster usually believes they are in the right). It’s too late now, but at the first sign of a transaction happening without your authority, it’s not a mistake or an oversight, you need to take a copy of the company formation documents to the bank and argue your case until you get success. This can take an unexpectedly long time because anyone dealing with the fraudster is in their “circle of belief” – how right you are is irrelevant until you can find a break in that circle, and get them to consider the possibility that you are not the crazy one (realise it often appears that way since you are frustrated and distressed, while the fraudster is living on a cloud of self-belief). It can take a few seconds, to hours. After that it’s easy and the bank will honour your request – but they won’t do this if they don’t believe you (it is their duty to be suspicious and on the lookout for fraud). GEt over it mate, you’ll find this isn’t a BNZ problem, but an NZ problem. As for those bitching about the netguard card, i used to do the same but BNZ have a 100% cover if a fraudulent activity appears on your account. Small price to pay for that level of FREE insurance. This is your fourth comment on the matter. I’m amused that you think this is going to solve any problems. Perhaps you should look at the issue of phones connecting to what looks like their own wifi, but is actually someone creating a fake ap, and getting all their banking details etc. No I am not making this up, it actually exists. Sorry to blow your trump card out of the water though, and yes sure it’s the forth comment as I’m responding to different things. Glad you can count however. Actually it has solves a lot of problems – people can check their balances on BNZ and ASB apps without entering passwords, which in turn reduces burden on call centers and the like. Man in the middle attacks may, just may, let you see balances, but not much more. There are plenty of attack vectors for banks, but they also have plenty of smart people working in security. Anyhow. This post was done in 2007, five years ago. I’m grateful that BNZ, Kiwibank and ASB in particular have moved a long way since then. Being that I’ve seen how many fraud cases that have come from this, you’re sadly deluded.